Thomas Gould 1802-1869 was born in Manchester, the son of Joseph Gould 1754-1821 and his wife nee Anne Wardle. He became a solicitor, and was in practice as Gould and Brookfield at 4 Paradise Square in Sheffield, by the parish church now the Cathedral. He married Frances Maria Brookfield 1805-1888, daughter of another Sheffield solicitor Charles Brookfield, his partner in the firm of Gould & Brookfield. Charles Gould 1832-1909. He became a barrister, King's Counsel, and Justice of the Peace. The Reverend Joseph Gould 1834-1908. Housemaster at Repton School. Marianne Gould 1836-1900. She was unmarried. William Gould 1838-1886. He became a solicitor and was in practice at Todmorden in Yorkshire. In 1863 he married Martha Ann Vaughan 1841-1880 at Llandrinio, Montgomeryshire. She was a daughter of Edward Vaughan 1794-1852 and his wife Martha Whittingham 1803-1879. Their son Lewis Edward Vaughan married Frances Maria Gould 1847-1898, and had three children who died in infancy. Anne (Anna) Gould born 1840. She seems to have died young. Thomas Gould 1841-1908. 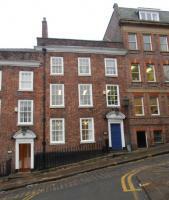 He also became a solicitor, and eventually took over the practice of his father at Paradise Square. Francis Gould 1843-1902. He was educated at Sherborne School and at Trinity Hall, Cambridge. He became a barrister of such eminence that he was authorised to write reports of law cases for the profession. He was unmarried, and lived in lodgings at Chalcot Crescent, Regents Park Road in London. His chambers were at No 6 New Square in Lincoln’s Inn. Frances Maria Gould 1847-1898. In 1876 she was married at Todmorden in Yorkshire to Lewis Edward Vaughan 1843-1910 of Trederwen Hall in Wales. He was a son of Edward Vaughan 1794-1852 and his wife Martha 1803-1879. Their daughter Martha Ann Vaughan had been married in 1863 to William Gould 1838-1886. They also had three sons, of whom the youngest Francis Herbert Vaughan was killed in action in Belgium in 1916 during WW1. The Reverend John Gould 1849-1920. Housemaster at Repton School. Their father Thomas Gould died in 1869. His widow Frances Maria Brookfield 1805-1888 died on 18 January 1888 (1). Magdalene Alice Brookfield 1850-1886. In 1873 she was married to William Irvine Ritchie 1850-1903, and had a family. Arthur Montagu Brookfield 1853-1940. He was an army officer, MP, diplomat and novelist. He married Olivia Harriet Hamilton 1857-1931. Charles Hallam Elton Brookfield 1857-1913. Although initially training as a solicitor he gave that up, and despite family opposition, became a famous actor. In 1884 he married Frances Mary Grogron 1858-1921. The two of them wrote a popular book about their mother called "Mrs Brookfield and Her Circle". In 1900 there was a literary sensation, when Thomas Gould 1841-1908, who had succeeded his father in the family firm, discovered in their cellars some manuscripts originating from the friendship of his uncle William Henry Brookfield 1809-1874 with Tennyson, Arthur Hallam and other friends. Would echo helpless laughter at your jest! Him, the lost light of those dawn-golden times" (2). "Students of Tennyson will be familiar with the fact that among the poet's college friends was William Henry Brookfield, whose death called forth the sonnet - 'Brooks, for they call'd you so who knew you best.' Brookfield was the son of Charles Brookfield, of the firm of Brookfield and Gould, solicitors, 4, Paradise Square, Sheffield. Recently Mr. Thomas Gould, son of the Gould mentioned above, and now head of the firm of Gould and Coombe, of 4, Paradise Square, when turning over an old box which had been lying in the office for sixty years or more, found a packet of old papers -" sallow scraps of manusoript"- which proved to be letters from Tennyson and Arthur Hallam to W.H.Brookfield, together with portions of manuscripts of "The Lotus Eaters" and "The Lady of Shalott". The letters are undated, but the postmarks show them to have been written in 1832 and 1833. This was shortly after Tennyson left Cambridge, and about the time of the publication of his first book of poems, which was printed in 1832, though it is generally spoken of as the edition of 1833. Most of the correspondence is of a very personal and intimate character, such as might pass between college chums writing freely to each other. But in Tennyson's letters there are allusions and references of much interest to students of the late Laureate. For instance, he refers to the fears that overtook him at this time about his eyesight - fears which are mentioned in the life published by the present Lord Tennyson. There are also strongly-worded protests against publication ot his poems in the magazines of the day. Evidently Tennyson was much pressed to contribute to these periodicals, and had difficulty in shaking off the importunity of editors and friends. The letters from Arthur Hallam are extremely interesting as showing his deeply religious feeling and the high tone which characterised his lightest thought ... the MSS of " The Lotus Eaters " and The Lady of Shalott" is in the handwriting of Arthur Hallam. Probably Hallam copied the earliest of these poems, and sent the MSS to Brookfield, who, after leaving college was not so much in Tennyson's company. There has been no opportunity of comparing these versions of the poems with the version published in 1833, but there seems no reason to doubt that the stanzas are substantially the same. Both poems were afterwards very much altered. In the edition of 1842 "The Lotus Eaters" was almost entirely recast, and some sixty or seventy lines of "The Lady of Shalott" were altered (3). "The MSS and letters are understood to have been handed over to Colonel Brookfield M.P., the eldest son of the late Mr. W.H. Brookfield (4)". Sadly Thomas Gould 1841-1908 who discovered the documents came to a tragic end. "Mr. Tbomas Gould, the firm of Gould and one of the oldest practicing solicitors in Sheffield, was found drowned in the river Derwent at Hathersage, on Saturday. He left his office on Monday week, with the intention of fishing, and nothing more was heard until Saturday night, when his body was found by another angler. The deceased had evidently been wading, and it thought he tumbled and fell into a deep pool. He was about 65 years of age ... Recently, Mr. Gould, in turning over old box which had been lying in the office the firm for sixty years or more, found a packet of papers which proved to be letters from Tennyson and Arthur Hallam to Mr. W.H.Brookfield, together with portions of the manuscript of "The Lotus-eaters" and "The Lady of Shalott." The letters were undated, but the post-mark showed them have been written in 1832 and 1833 - shortly after Tennyson left Cambridge, and about the time of the publication of his first book of poems. At the inquest, on Monday, a verdict of 'Accidental death by drowning' was returned (5)". (1) "Gould.— On the 18th inst.,at her residence,32, Wilkinson street, Sheffield, Frances Maria, widow of the late Thomas Gould, solicitor, and eldest daughter of the late Charles Brookfield, of Sheffield, solicitor, in the 83rd year of her age." Sheffield Daily Telegraph 23 January 1888. (2) Sheffield Daily Telegraph 6 March 1908. (3) Birmingham Daily Post 14 May 1900 quoting the Sheffield Telegraph. (4) Abergavenny Chronicle 18 May 1900; Exmouth Journal 19 May 1900; Warminster & Westbury Journal and Wilts County Advertiser 19 May 1900. (5) Grantham Journal 1 August 1908.